On July 27, 1921, Sir Frederick Banting and Charles Best succeeded in isolating insulin from canine pancreases and thereby discovered the first effective treatment for diabetes mellitus. The Persian polymath and physician Avicenna (Ibn-Sina) described diabetes in detail in his monumental text, The Canon of Medicine (al-Qanun fi at-Tibb), but like all his predecessors and successors for the next 900 years, he was not able to provide an effective treatment. The modern era of diabetes research began in 17th century England. Thomas Willis, an English anatomist and neurologist (in fact, he invented the term neurology), dedicated a chapter in Pharmaceutice rationalis (1674) to diabetes in which he described the differences between diabetes mellitus and diabetes insipidus. As a result of his groundbreaking observations, as well as his illustrious readership, Willis’s disease was for centuries a commonly used term for diabetes. In 1776, Michael Dobson discovered the increased blood sugar during diabetes (hyperglycemia), and that the sweet tasting compound in the urine of a diabetic was a saccharide. This sugary compound was identified as glucose almost 40 years later. The 19th century saw a series of important discoveries on the topic of diabetes and brought new understanding of the clinical symptoms of the disease. Oskar Minkowski and Joseph von Mering were the first to successfully and consistently remove the entirety of a dog’s pancreas. The dogs developed the severe form of diabetes mellitus with all the symptoms that can be observed in human patients. This came as a surprise, as the scientific consensus at the time stated the extirpation of the pancreas had little to no consequences. Minkowski and von Mering noted in their 1890 publication that the scientists who performed this procedure previously either failed to completely remove the pancreas or didn’t recognize the symptoms of diabetes mellitus. Another factor was the low survival rate of diabetic dogs because of their deficient wound healing and increased susceptibility to infections. Minkowski proposed in light of his experiments that the pancreas, in addition to its established role of producing pancreatic juice, also secretes a substance pivotal for the sugar metabolism into the bloodstream. In 1893, Gustave-Edouard Laguesse suggested that the cells responsible for this secretion are located in the Langerhans islets and in 1909, Jean de Mayer named the yet undiscovered glucose-controlling substance insulin. In the years following Minkowski’s and von Mering’s discovery, many scientists tried to isolate this unknown substance from the pancreas, but the digestion enzymes of the pancreatic juice thwarted most of these attempts. The German physician Georg Zülzer was presumably the first person who successfully treated a diabetic animal with pancreas extract, but human trials failed due to insufficient purification. Other similar experiments resulted in the test animals’ death from hypoglycemia. Around that time, the standard (and only even slightly effective) treatment for diabetes was extremely restricted diets and as a result, many patients starved to death. All others eventually succumbed to their affliction. Nothing had changed for the patients since the time of the Ebers papyrus. In 1920, the Canadian surgeon Frederick Banting (not yet Sir), a Great War veteran with a keen interest in diabetes, developed a method of producing pancreatic extracts without any of the interfering digestive enzymes. By ligating the pancreatic ducts, he was able to degenerate the juice-producing acini while leaving the Langerhans islets intact. He found support in John J.R. MacLeod, professor of physiology at Toronto University, who provided Banting with limited lab space and an assistant, the physiology student Charles Best. On July 27, 1921, Banting and Best isolated their first pancreas extracts and injected them into a diabetic (pancreatectomized) dog, whose condition improved markedly. After the addition of the biochemist James Collip to the group, they refined their extraction methods and discovered the pancreases of calf fetuses were much more suitable for the isolation of insulin since they do not yet produce pancreatic juice. On January 23, 1922, Banting treated 14-year-old Leonard Thompson with their improved extract. The blood sugar of the boy, who weighed only 29 kg when he received the injection, fell significantly and his ketoacidosis disappeared, a medical triumph. Banting and MacLeod were awarded the Nobel Prize in 1923. To Banting´s and MacLeod´s dismay, The Nobel Foundation did not recognize Best’s and Collip’s contribution, so they decided to share the prize money with their colleagues. Within a few years, production of insulin sufficed to provide a medical treatment for almost all diabetics in the Western world, largely thanks to Banting’s and Best’s decision to make the patent available free of charge. Dobson, M (1776). Experiments and observations on the urine in a diabetes. Med. Obs. Inqu., 5, 298-316. 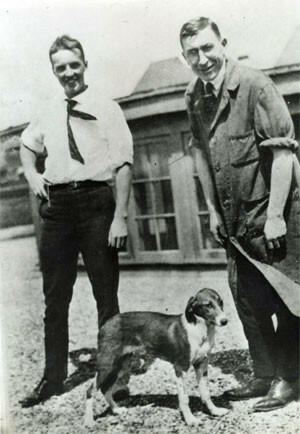 Image of Sir Frederick Banting and Dr. Charles Best, co-discoverers of insulin, and one of their lab dogs (Photo: Library and Archives Canada/ cropped and levels adjusted).